As you complete your new rain garden why not contemplate some garden decorations? Decorating your garden can give you that much more pleasure in your project while also providing wildlife even more reasons to come to your home. While the garden is a good start, it doesn't provide a water source. There are a number of ways to decorate your garden. You could stick the common plastic flamingoes out, but why, when there are so many better alternatives that can be beautiful while also performing a function. We can't forget the beautiful and useful hummingbird , another delightful pollinater and fun bird to watch. Consider also frogs and toads. Toads aren't pretty, though your youngsters may delight in chasing them, but they do eat a lot of insects that may be eating your flowers. There are plenty of adorable toad houses that will lure these little hoppers to your garden. Look at a few at Yardiac. They are adorable and will make the perfect gift for that new rain garden owner. * One other bit of garden decor you may find useful and very beautiful around your home are rain chains . * Are you looking for theme ideas or tips on cleaning and repare of your home garden decor try Home-Garden-Decor.net . * Have you thought about adding a bench to your garden so that you can relax to the gently sounds of nature? * Check out these beautiful flower photos. If you're looking for things just for the asthetics why not try a rain gauge (hey, it's a rain garden), a sundial or weathervane. 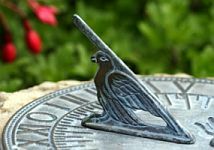 A sundial is a beautiful addition to any yard that gives it that ancient appeal while being strangely useful at the same time, if you know how to place them. Wind and Weather carries a wonderful selection of these items and other cool gadgets, like barometers. Try tracker-outdoors and Yardiac for more decorating ideas.